D.R. (Jack) Gray Ltd was founded in 1956 by Jack Gray and it is now being run by his son Tony and grand son Nathan. The company is a member of the Registered Master Painters and an accredited site safe business. DR (Jack) Gray Ltd operates from 97 Camberwell Rd Hawera Taranaki, a workshop also at 137 Molesworth Street St New Plymouth and have a retail outlet at 91 Glover Rd Hawera (Hawera Resene Colorshop). Over the years, we have grown tremendously in strength and now cover a full range of painting services for industrial, commercial & domestic requirements, as well as wallpapering, seamless floor coating & 2 pot epoxy finishes for floors. We currently employ 40 members split between both workshops and retail outlet. We use the most superior products to give you the kind of result you were looking for. More than 60 years in business has seen D.R. 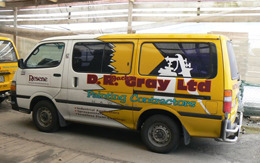 (Jack) Gray Ltd grow into one of Taranaki’s largest and most successful painting contractors. Jack started his painting business with one other painter and saw business expand rapidly through the 1960s and 1970s. At one stage, he employed 45 staff working on the Fonterra state-of-the-art Whareroa dairy factory in 1973. The men worked in two shifts to get the job completed in time. The company has a history of guaranteeing its work. Jack Gray was committed to providing a quality service and was one of the only painters back in the 1950s to guarantee his work. Jack’s professional attitude paid off and the business has never been short of work since Jack came to New Zealand from Derbyshire, via Australia. The vast range of the buildings painted by the company include the South Taranaki District Council administration offices in Hawera, the Hawera Hospital, The Warehouse’s new building in Hawera, Swift Energy, Lactose, TSB Banks, Taranaki Base Hospital, WITT accommodation in New Plymouth, the Eltham Rennet Company (now Mainland), Kupe Offices & Administration, Centre City Car Park Project, swimming pools throughout Taranaki, and a variety of Kohanga Reo, Marae, Greenhouse NP, Motels, Hotels and schools. Tony is the Manager/Director and is based in New Plymouth with Nathan whom also is a Director, Managers the Hawera branch. Donna Henderson is the Administration/Finance Manager and has also been with the company for over 25 years. So when it comes to all round experience there's none better.